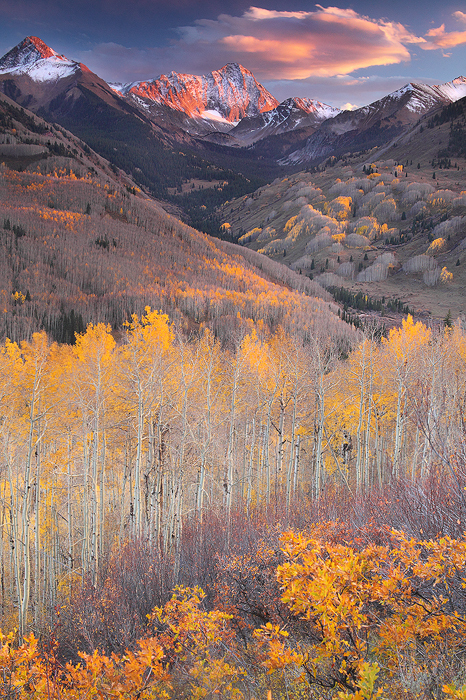 There is fresh snow on the high mountain peaks, a cold bite to the air, the last of the golden leaves cling to the thousands of aspens below Capitol peak. A sure sign that the short but beautiful Autumn season in the Rockies is coming to an end. Winter is on its way. High above the normally lush green valley is one of Colorado's 54 "fourteeners", Capitol Peak". Part of the staggering Elk Mountains, Capitol Peak is the 30th highest mountain in the state, and surely one of the most impressive.